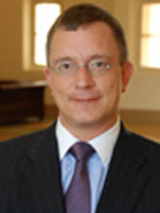 Donald J. Kochan is an adjunct scholar with the Mackinac Center and professor of law at the Dale E. Fowler School of Law at Chapman University in Orange, Calif. He received his J.D. from Cornell Law School (1998), where he was a John M. Olin Scholar in Law and Economics and managing editor of the Cornell International Law Journal. He also served as editor and executive editor of Harvard Journal of Law & Public Policy symposium issues in 1997 and 1998. He received his B.A. from Western Michigan University (1995), with majors in political science and philosophy. After completing law school, Kochan was law clerk to The Hon. Richard F. Suhrheinrich of the United States Court of Appeals for the Sixth Circuit. He previously taught at the University of Virginia School of Law and George Mason University School of Law. Prior to that he was in private practice at the firm of Crowell & Moring LLP in Washington, D.C., where he specialized in Natural Resources & Environmental Law. He is the author of numerous published articles on subjects including property rights, environmental law, natural resources issues, international law and human rights, historic preservation, tort reform, and various issues of law and economics and constitutional law. Fighting Urban Blight or Trashing Property Rights?